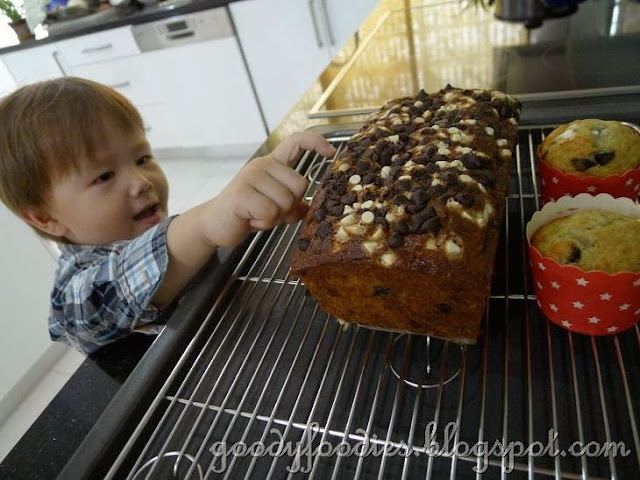 2013 has been a good year for me in the kitchen - being able to experiment, try new recipes as well as getting the kids involved in our daily baking/cooking and having fun together. I am also happy that I was able to post a blogpost almost everyday (358 to date) this year and hope to continue this streak next year. I am very grateful to my family for being my guinea pigs as well as my supportive friends and readers for trying out my recipes and reading my posts. Also, many thanks to everyone who participated in the latest "Cook Like Bill Granger" and other Cook Like a Star bloghop events this year. 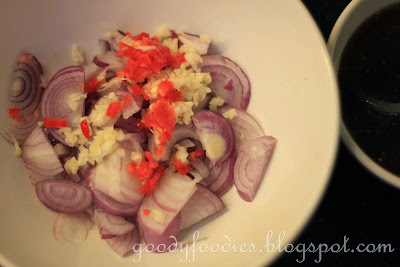 I certainly enjoyed trying new recipes and visiting my fellow bloggers blogs for inspiration and friendship. 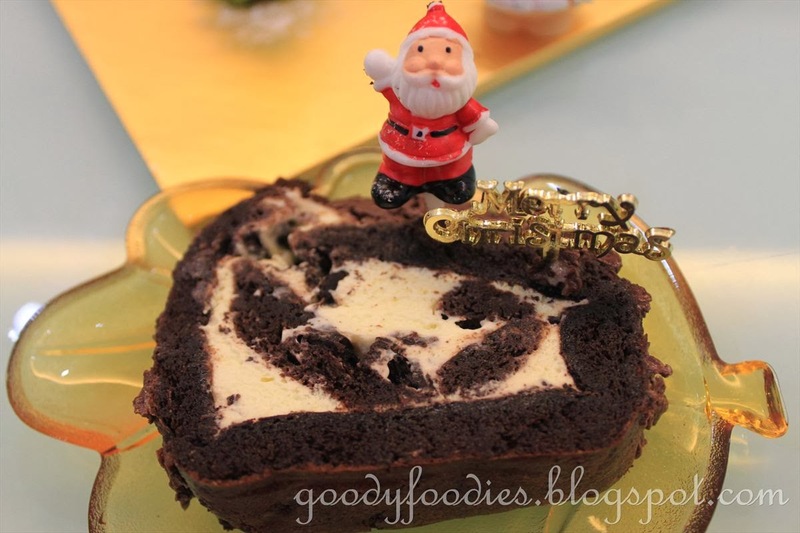 Just a reminder that my Christmas event will run to 31 January 2014, so feel free to post any Christmas recipes you may still have at this link. 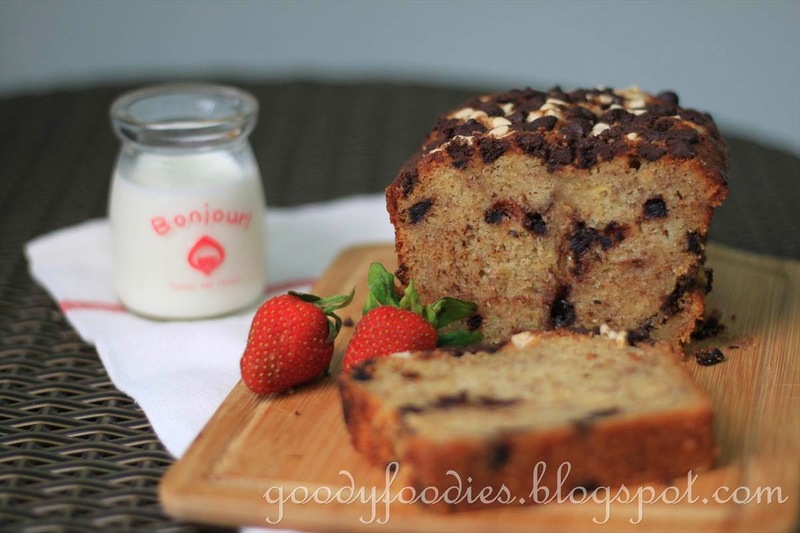 Baby D saw the bunch of bananas sitting on the kitchen island and asked "Mummy, can we bake a banana cake today?" I quickly googled a Bill Granger recipe and we're ready to go! 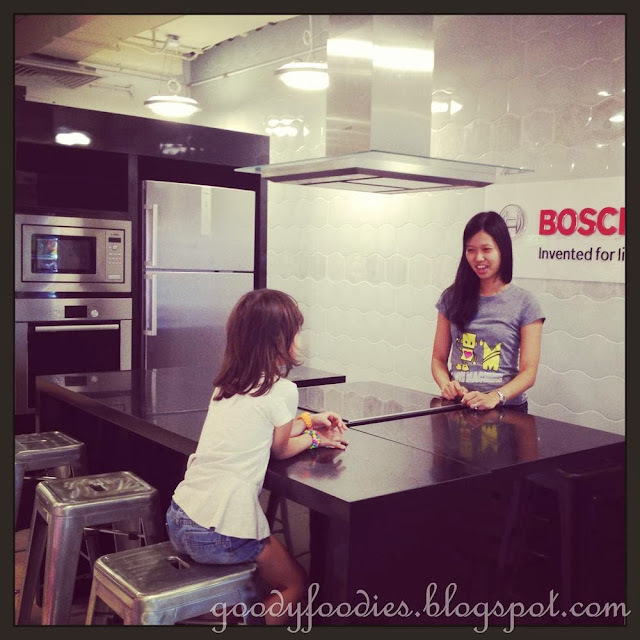 After a year of kitchen training, I am so happy to see Baby D so independent and confident in the kitchen. 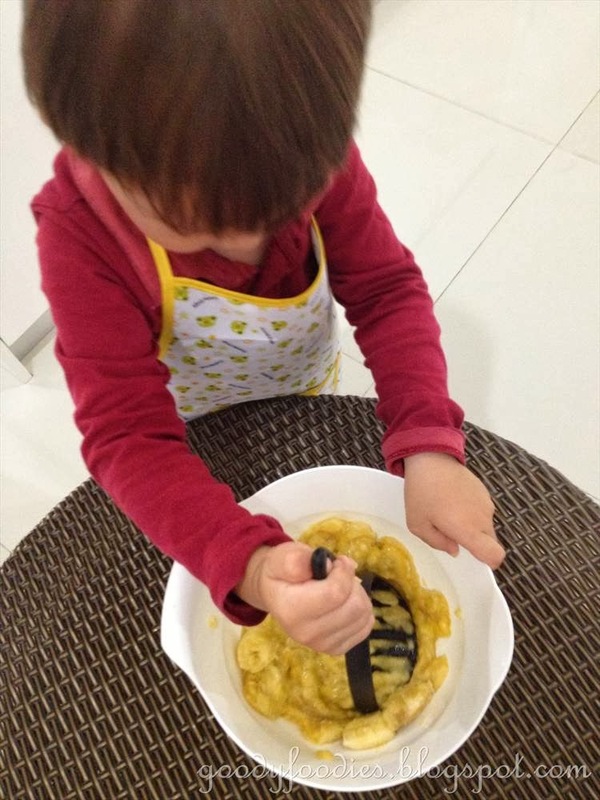 He knows where to get the kitchen tools, put on his apron, peel the bananas and mash them, help mix the batter, and tells me when the oven is preheated and ready to go. 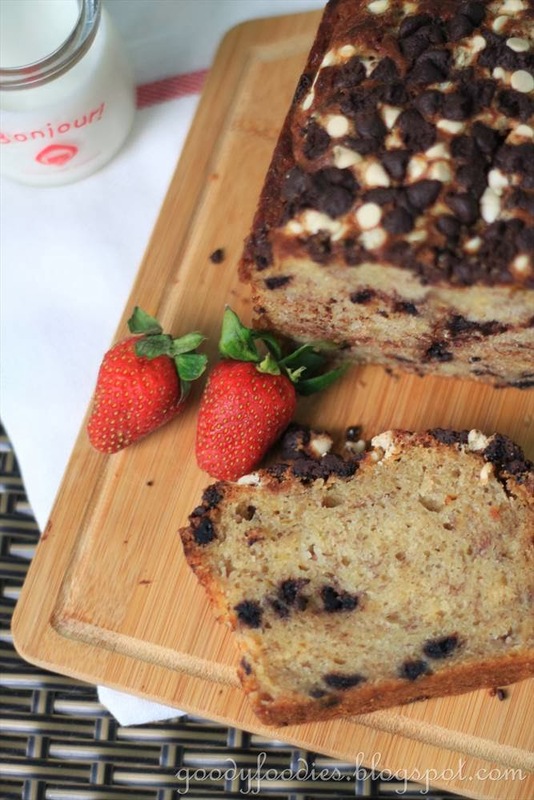 We reduced the sugar in this recipe slightly as we deemed the amount called for would make the cake overly sweet. Furthermore, we would be adding chocolate chips to the cake/bread. 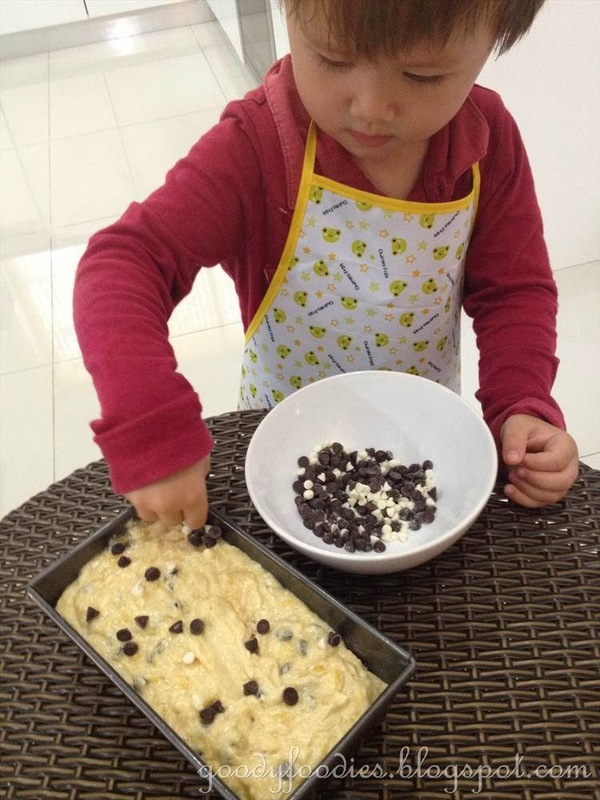 Upon Baby D's request, we mixed 3/4 of the chocolate chips into the batter and sprinkled the balance on top of the cake. My choc banana bread is ready! 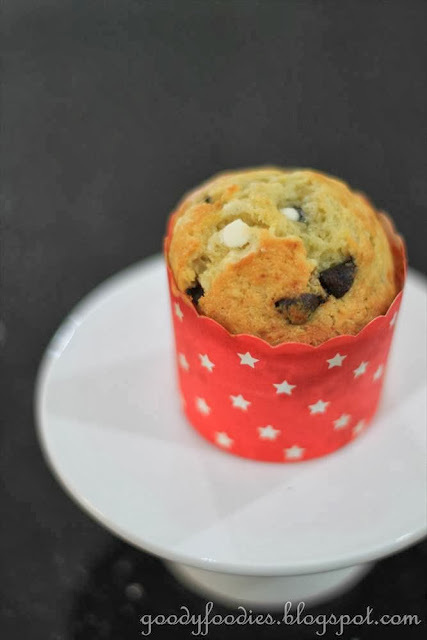 Since our loaf tin was slightly smaller and we had leftover batter, we placed them in muffin cases. 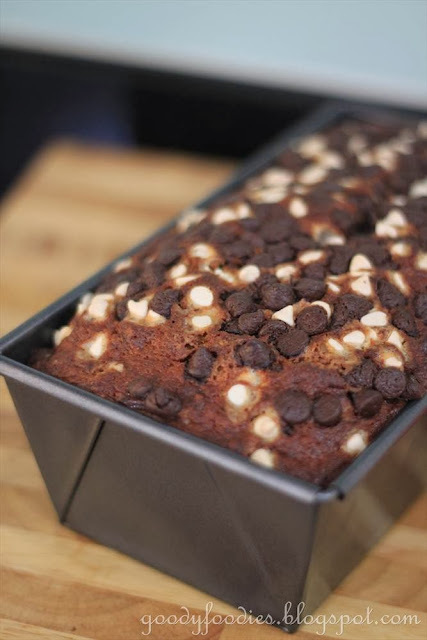 The cake turned out to be moist and fragrant, and we like the addition of the chocolate chips. Maybe a bit sweet eaten on its own, but with a glass of milk, it was just nice. Thanks Baby D for doing such a wonderful job! 2. Sift the flour and baking powder into a large bowl. 3. 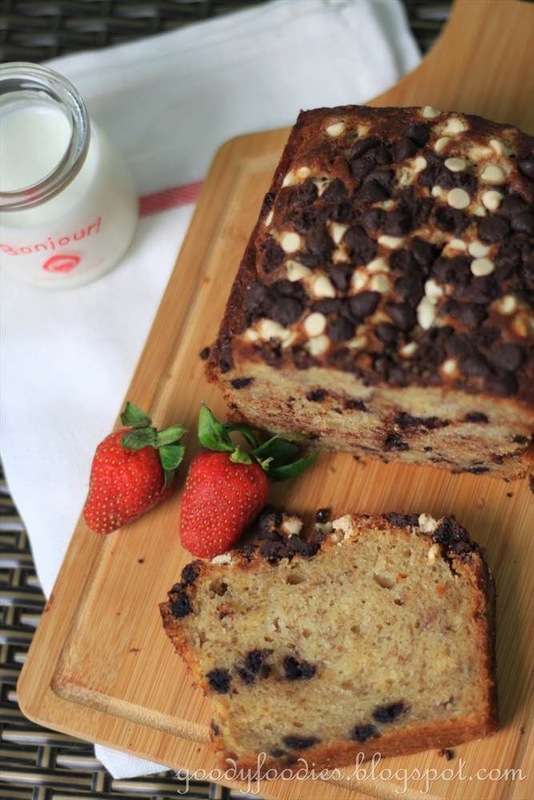 Mix the butter, sugar, banana, eggs, vanilla extract and chocolate chips in a separate bowl. 4. Add to the dry ingredients and stir to combine, being careful not to overmix. 5. Pour the batter about 3/4 full into a lightly greased 19 x 11 cm (7 1/2 x 4 1/2 inch) loaf tin and bake for 1 hour 15 minutes, or until the bread is cooked when tested with a skewer. 6. Leave to cool in the tin for 5 minutes before turning out onto a wire rack to cool. Serve in thick slices with butter. Makes 8 to 10 slices. Note: I reduced sugar from 250g to 180g. We mixed 3/4 of the chocolate chips into the batter and sprinkled 1/4 on top (as per Baby D's request). You can also bake them in muffin cases, and it will take about 25-30 minutes. 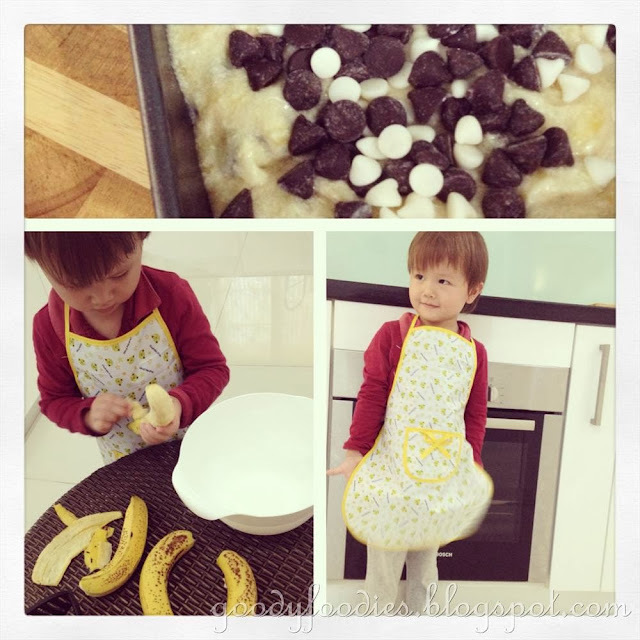 See here for more kids-friendly recipes. I am submitting this to the "Cook Like Bill Granger" event which I am co-hosting with Zoe of Bake for Happy Kids and Mich of Piece of Cake. 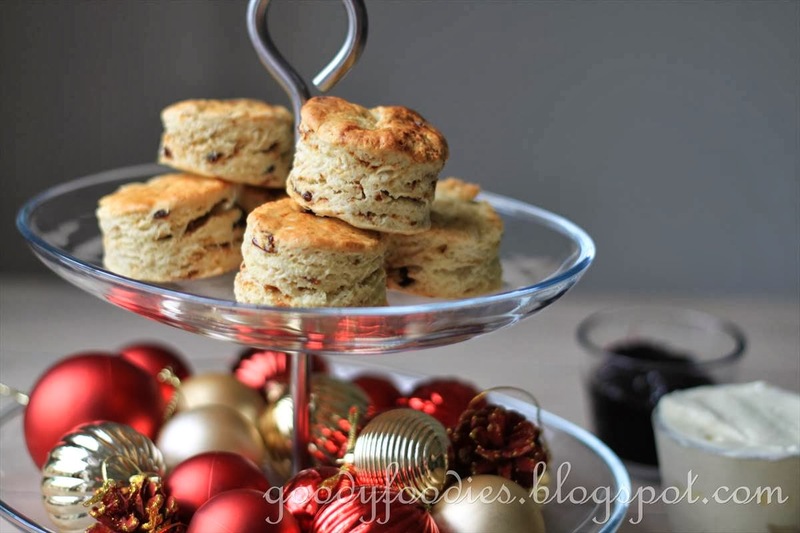 To join, simply cook or bake any recipe from any Bill Granger websites or cookbooks for the whole month of November and December 2013. You can link your posts at one of the host's pages. Your post must be a current post i.e. 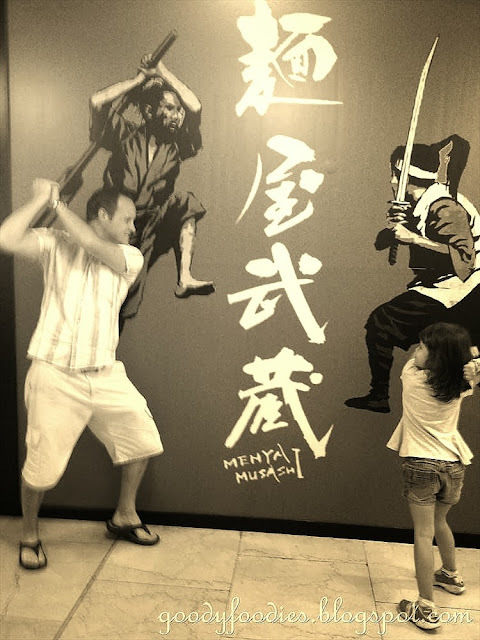 posted in November and December 2013 - please do not link older posts.Please mention Cook like a Star in your post and link back to Zoe of Bake for Happy Kids, Mich of Piece of Cake and Baby Sumo of Eat your heart out. Canapés are great for parties, be it Christmas, New Year's Eve or Hogmanay. 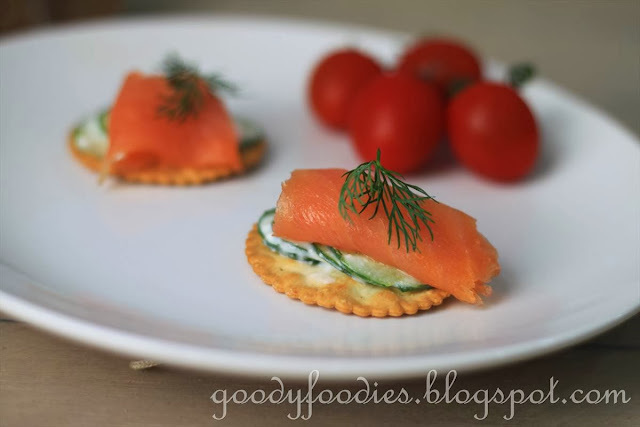 A canapé looks really pretty on the plate and can be eaten in one bite, making it easy for your guests to stand around, mingle and eat at the same time. 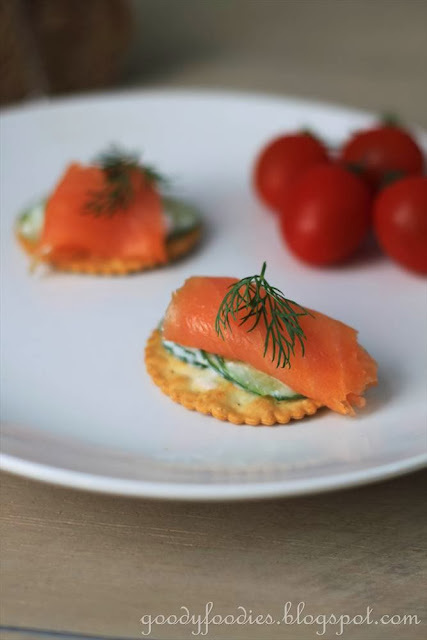 The technical composition of a canapé consists of a base (e.g., bread, pancake or cracker), a spread, a main item, and a garnish. When we were at Jaya Grocer, we were pleasantly surprised to see Scottish smoked salmon in the fish (chiller section) department. This is our first time coming across Scottish ones, as other supermarkets usually stock Norwegian variant. And Scottish smoked salmon is my favorite of all! 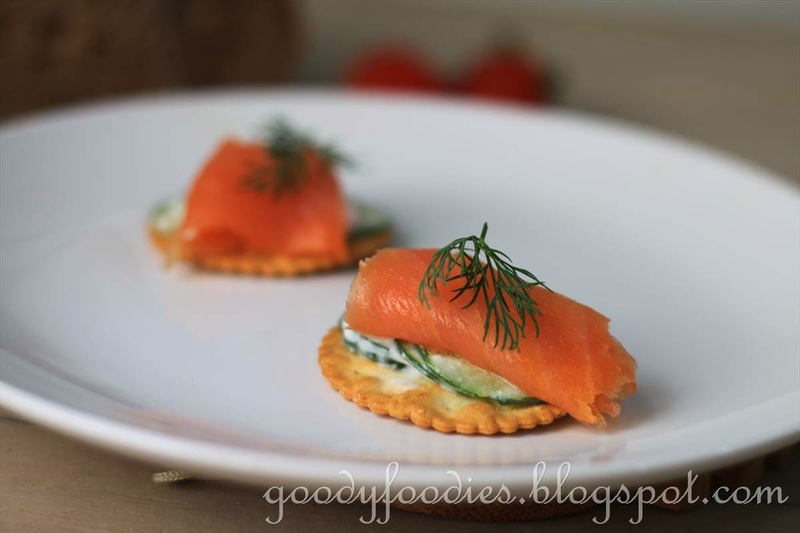 It is common to see smoked salmon and cream cheese canapes, but I thought of making a lighter version using natural yogurt. 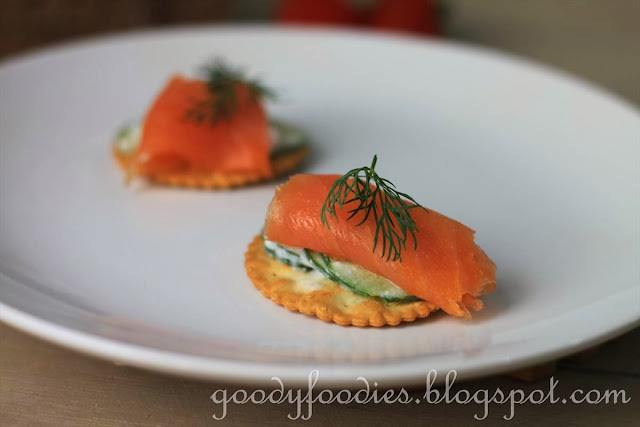 The canapé crackers are nice and crunchy, topped with the cucumber yogurt slices, delicious slivers of Scottish whisky smoked salmon and dill. This is easy to put together, looks fantastic on the plate and makes great finger food. I sure would love to stand next to a plate of these canapes and help myself to as much as I can! 1. Place yogurt, lemon juice, and shallot in a bowl and mix well. Season with salt, then add the dill and cucumber and mix until well combined. Set aside. 2. 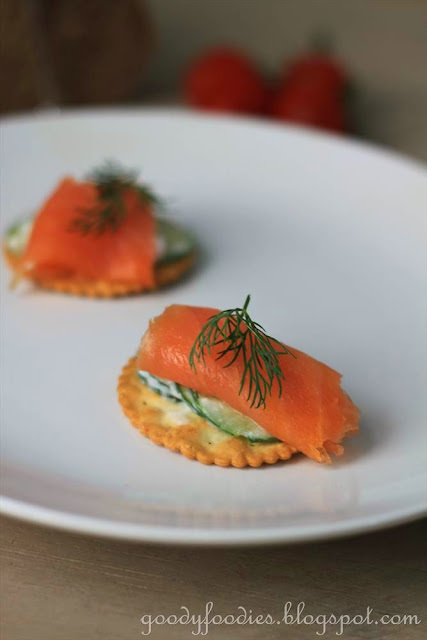 Arrange canape crackers on a serving plate, then top with 3-4 slices of cucumber yogurt salad (from Step 1), and a sliver of smoked salmon. Garnish with fresh dill, before serving. 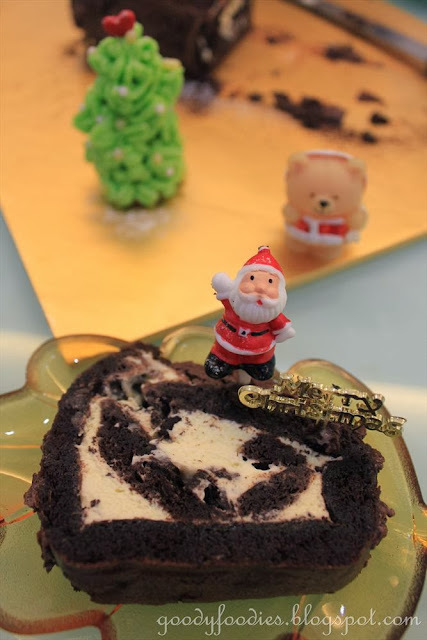 I am submitting this to the "Baby Sumo's Christmas Recipes Collection 2013" event which I am hosting. You can link your recipes here. 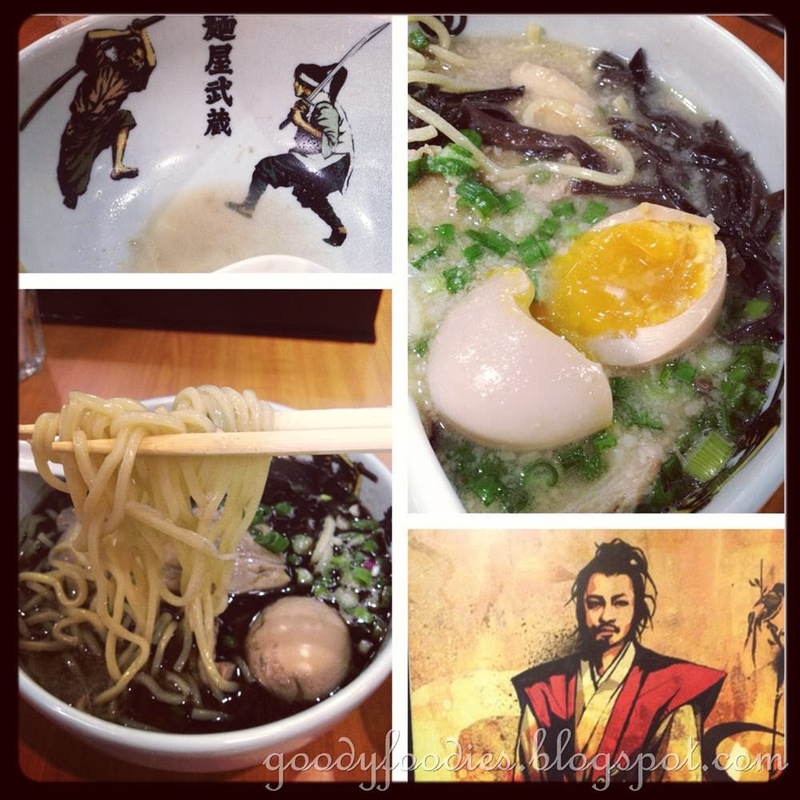 One of my favorite ramen places in KL is Menya Musashi. I used to frequent the outlet at Jalan P. Ramlee but I do the find the parking there troublesome as we need to park in KLCC and then walk over to the outlet. So I was delighted to find that they have opened a new outlet recently at The Intermark (where Doubletree by Hilton is located). Furthermore, there is also a Jaya Grocer here, so we could do some shopping after our meal. Oh and another bonus is that parking at The Intermark is free on Sundays. 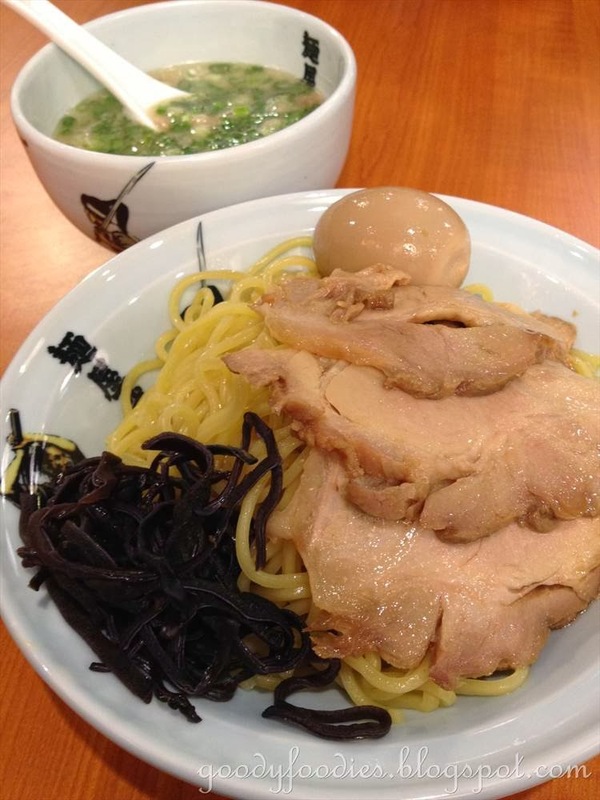 This outlet is pretty compact, and when it is crowded, customers can sit at the adjacent Non-Halal food court and order from Menya. 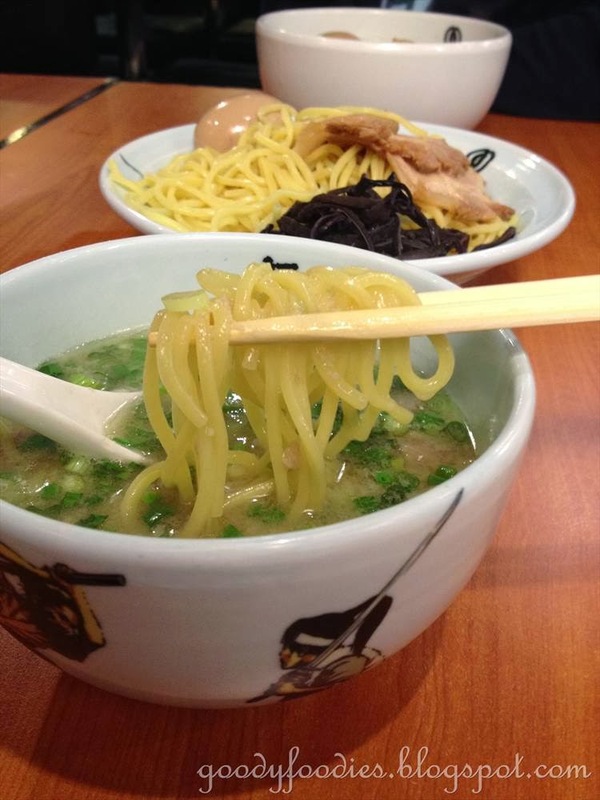 Over here, you get a choice of 4 types of soups to go with your ramen - white, red, black and miso. 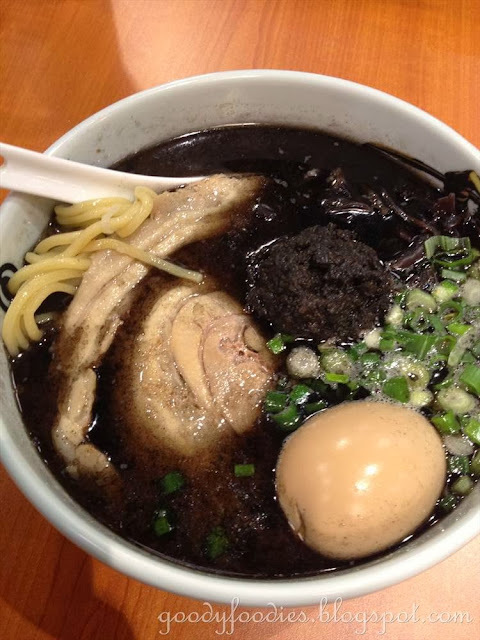 We have tried both the black and white ramen, which comes with 2 pieces of roasted pork, 1 ajitama (flavoured egg), spring onion and black fungus (RM20). I'm pretty sure the noodles here are slightly thicker than the Jalan P. Ramlee outlet. 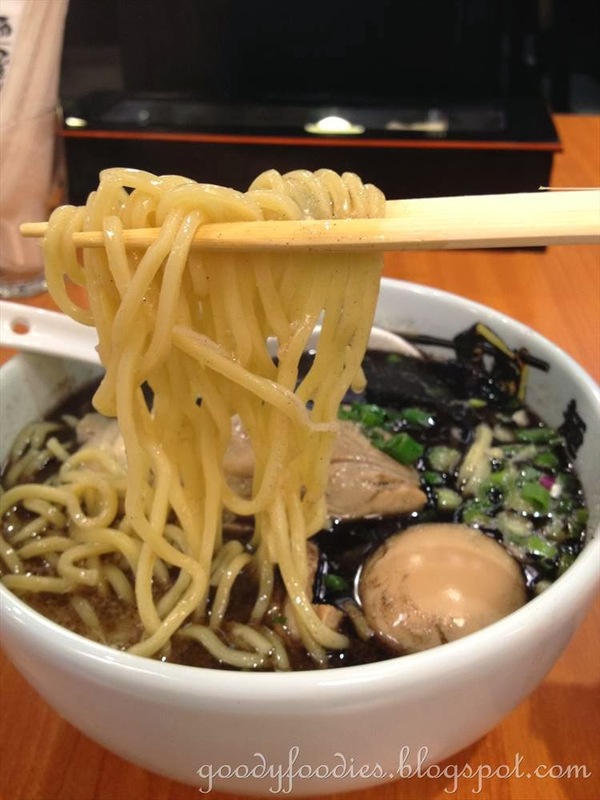 But I like it - nice and springy (similar to the ones we had in Singapore) ;) Out of the two, I prefer the white soup. Both the ajitama and chashu is pretty good too. 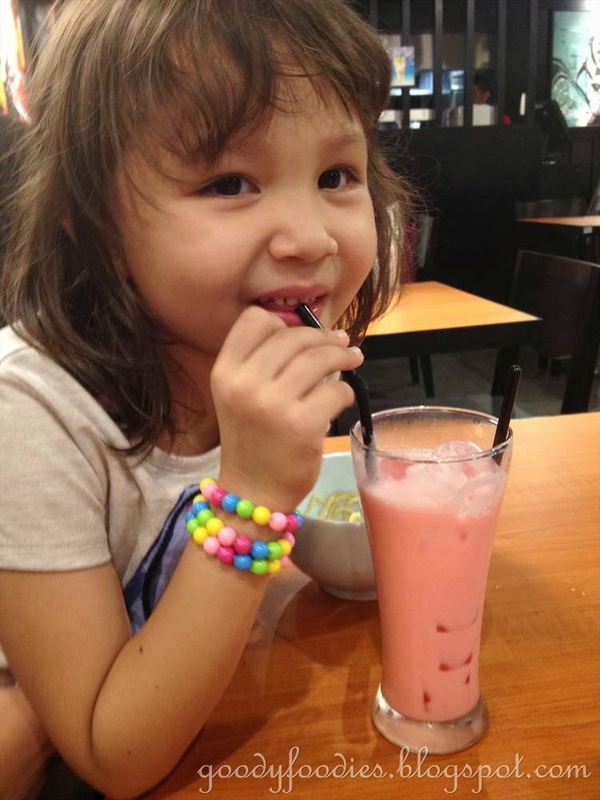 We also tried their ice coffee blend (RM5) and Strawberry milk shake (RM5). 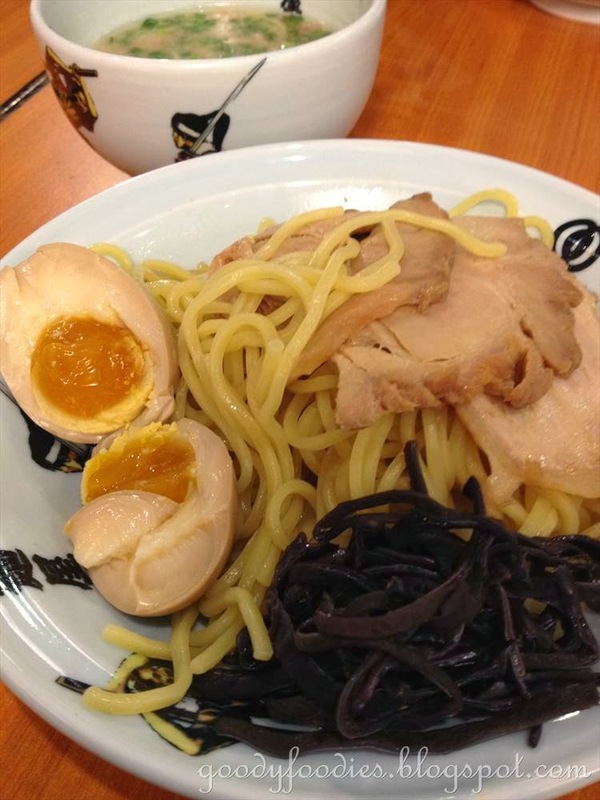 On another visit, we also tried the tsukemen (dry noodles with dipping sauce). I wanted to try the black tsukemen, but according to the waiting staff, I could only order the white sauce for tsukemen. I enjoyed this and so did Baby C - I think she enjoys this much more than the soup ramen. The sauce here isn't too salty, so at the end when we've finished all our noodles, we found that we could actually drink it down as a soup. 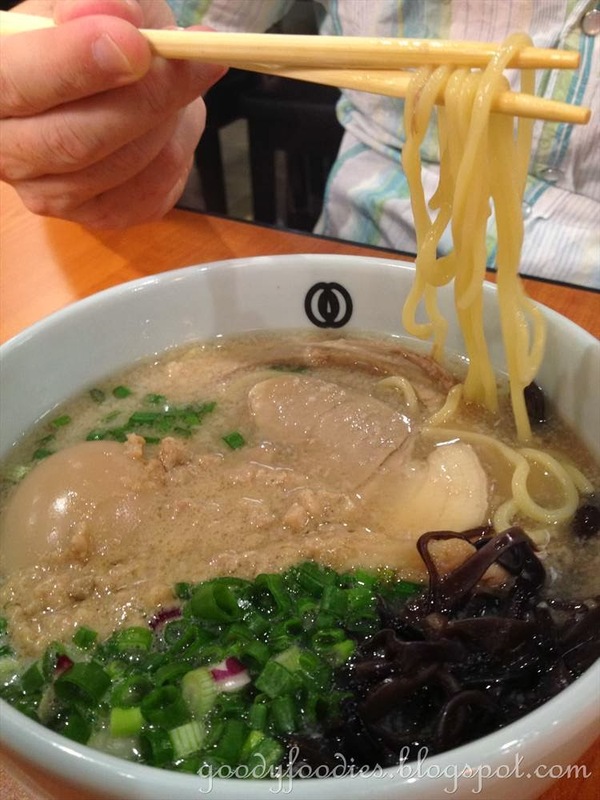 Verdict: Great ramen, good location. Parking: Free on Sundays, or spend RM30 and above at Jaya Grocer and get 3 hrs free parking. 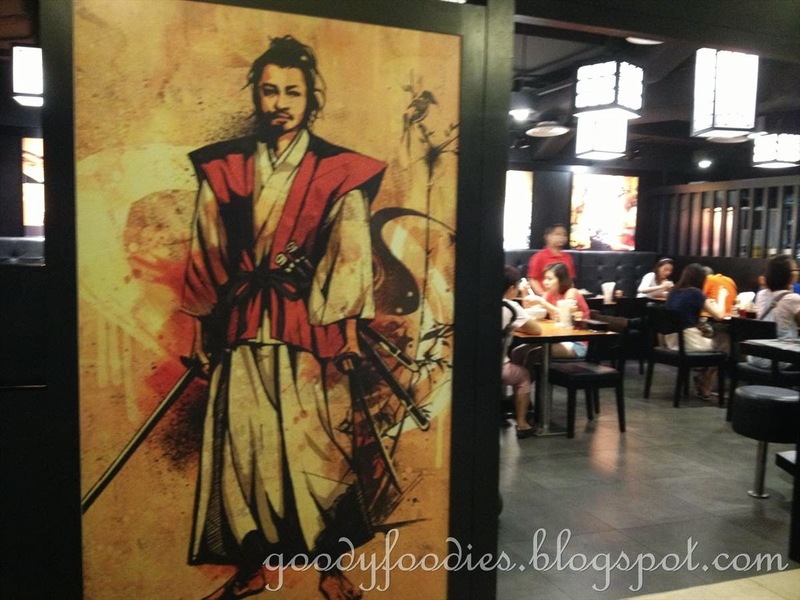 Location: Menya Musashi, LC-01-05, Lower Concourse, Intermark Mall, The Intermark, 348 Jalan Tun Razak, 50400 Kuala Lumpur. This year, during the Big Bad Wolf sale, I got Marcus Wareing's cookbook "How to Cook the perfect..". Knowing how much I love afternoon tea, Hubby got the book out and set out to make me the perfect date scones. The recipe in the book is actually for sultana scones, but we had a box of dates sitting in the fridge, hence Hubby decided to substitute with equal amounts of dates. 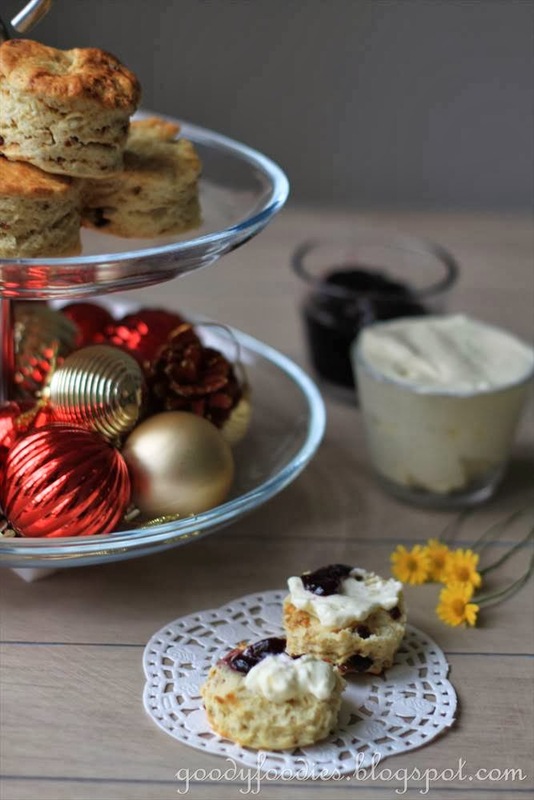 According to Marcus Wareing, scones are very easy to make but they need a light touch (don't overwork the dough) or they'll be chewy and stodgy. It is also important not to roll the dough too thinly or you'll have biscuits rather than scones. 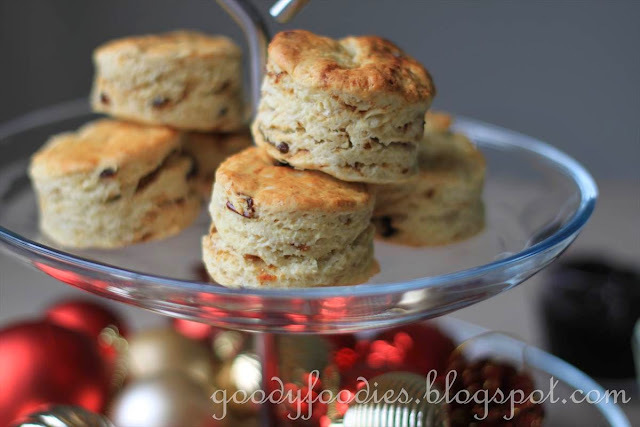 I was taking a siesta when the baking was happening, and Hubby pinged me to say "come get your scones." 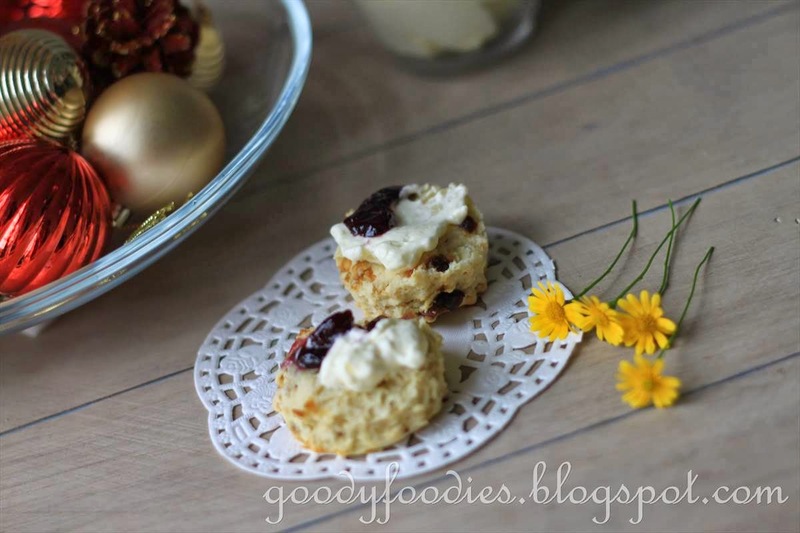 A cup of English breakfast tea, beautiful well-risen scones, whipped cream and jam greeted me. 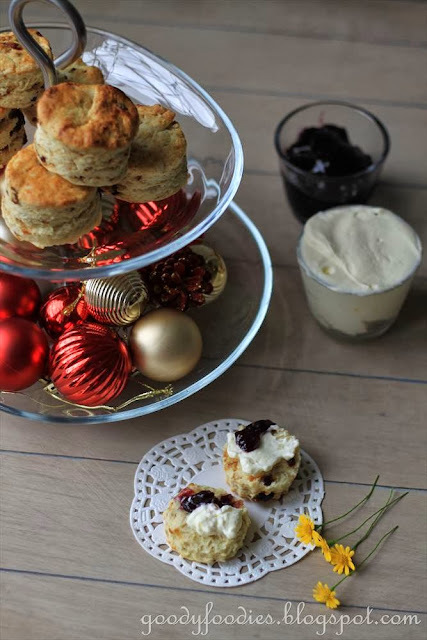 Nothing beats eating a freshly baked warm scone slathered in whipped cream and jam. Wonderfully moist and crumbly. Perfection. These were so good that I couldn't stop at eating one... or two.... you can also serve these with clotted cream (see here for recipe for Mock Devonshire cream). Perfect bites for a Christmas or New Year party. Or simply any day... I definitely wouldn't mind having this again for afternoon tea. Recipe adapted from Marcus Wareing "How to make the perfect.."
1. Heat the oven to 200°C (fan). Line a baking tray with non-stick baking parchment. 2. Sift the flour, baking powder and salt into a bowl. Rub in the butter until the mixture resembles breadcrumbs, loosely gathering the mixture together in your hands without squeezing or pressing. Stir in the sugar and dates (or sultanas). 3. Mix the milk and egg together, then slowly pour two-thirds into the flour, stirring constantly with a table knife until the dough comes together. It should be quite firm, but moist, so add a little more of the milk and egg if it appears too dry. 4. Turn the dough onto a lightly floured surface and knead briefly for only a minute or two - just long enough to be able to shape it into a rough, loose ball. Now roll it out until it's about 2cm thick. Cut out about 12 scones using a 6.5cm pastry cutter, dipping it in flour before each cut. 5. 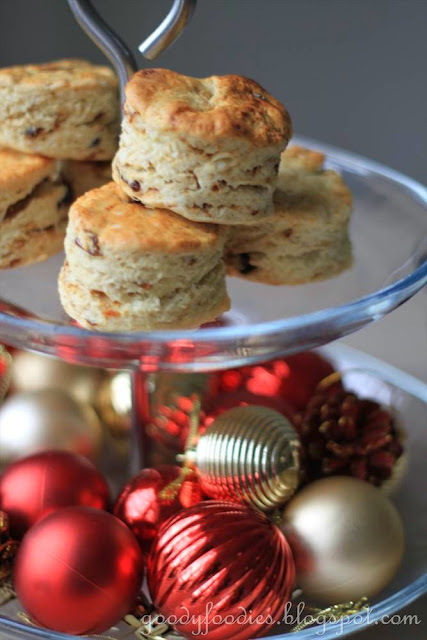 Place the scones on the baking tray and brush the tops lightly with the remaining egg and milk mixture (from Step 3). Bake in the middle of the oven for 10-15 minutes, until risen and light golden brown. 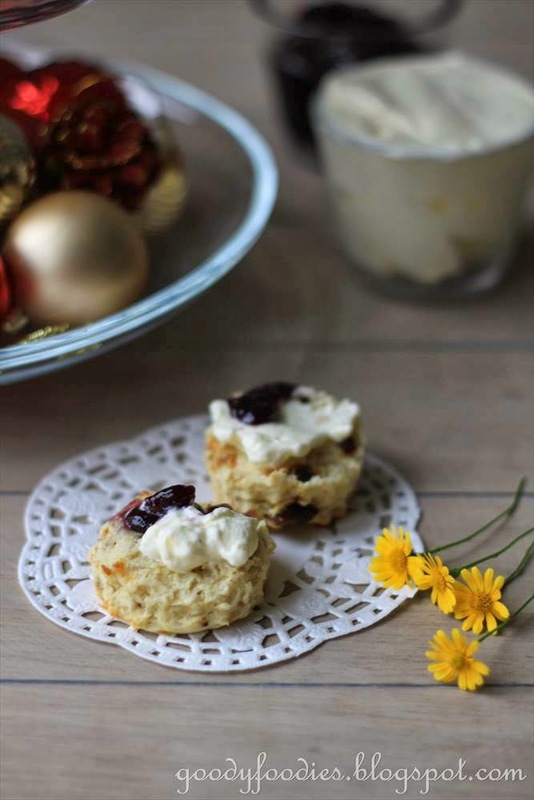 Serve as soon as possible, preferably while still warm with either whipped cream or clotted cream and jam. I am also submitting this to Cook-Your-Books #7 hosted by Joyce of Kitchen Flavours . 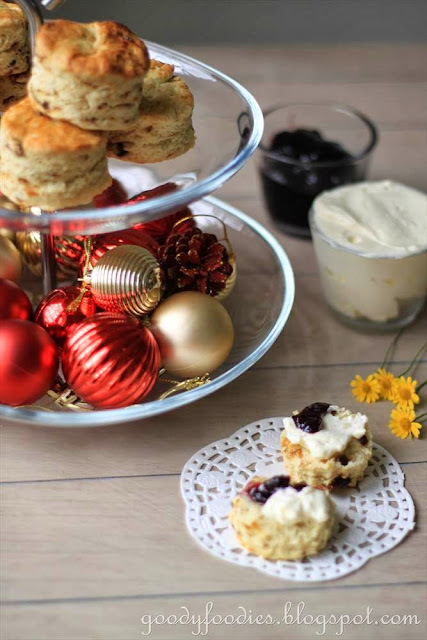 On Boxing Day (26 Dec), it is common to have leftovers from Christmas dinner for lunch/brunch. We usually cook roast beef for Christmas Day, hence any leftovers would be used to make stovies (a traditional Scottish meat and potato stew). 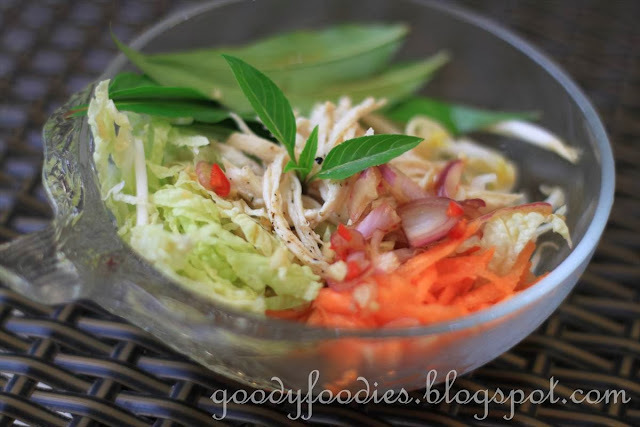 If you find yourself with leftover roast chicken or turkey, it would be great to use it in this Vietnamese Chicken (or Turkey) salad. If you do not have any leftovers, no worries - you can easily use chicken breast fillets for this, roasting will take a mere 15 minutes. 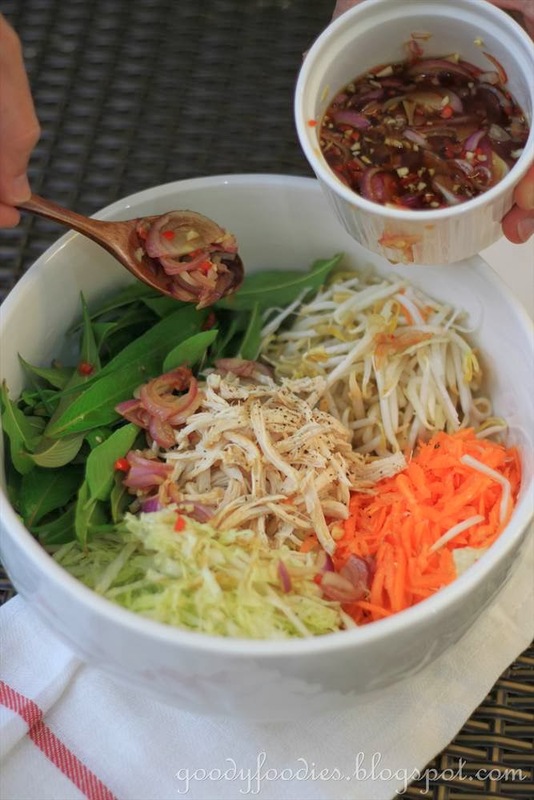 After all the heavy eating on Christmas Day, this salad is certainly a nice change. 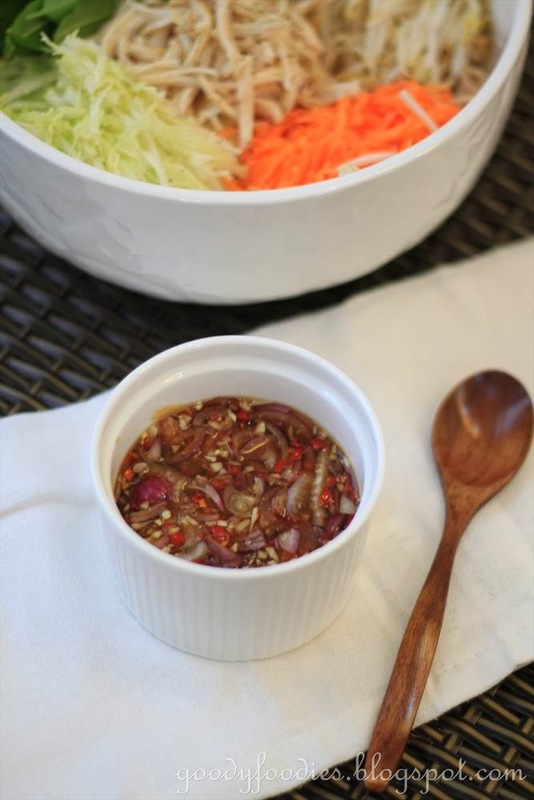 The dressing made from lime juice, fish sauce, rice vinegar, garlic, shallots and chilli is appetizing and tangy. 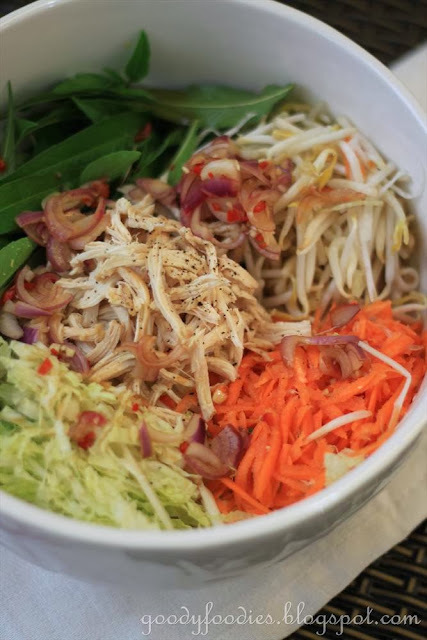 The salad on the other hand is made up of bean sprouts, Thai basil leaves, Chinese cabbage, carrot and Vietnamese mint leaf. 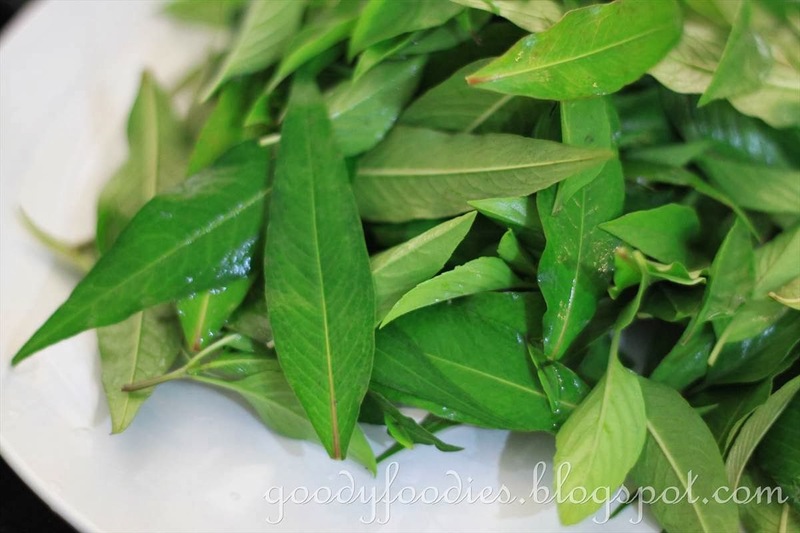 Vietnamese mint leaf is also known as daun kesum in Malay, a herb commonly used in assam laksa in Malaysia. 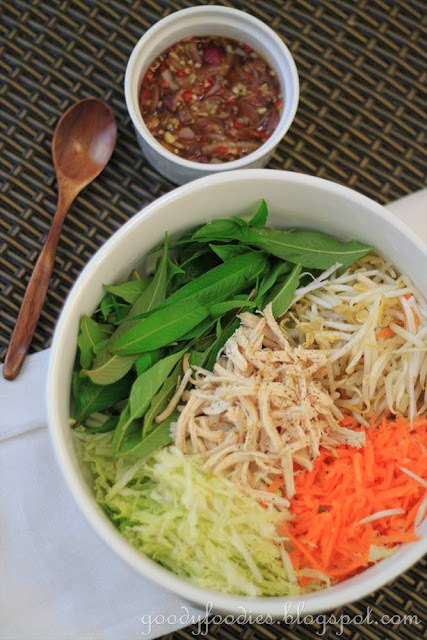 The original recipe calls for 1 cup of Vietnamese mint leaf, however, this herb is pretty spicy, so you may want to reduce it to 1/4 cup. If you do decide to chop it up finely, do it just before serving as the leaf tends to turn black quickly once you cut it. I also decided to use large red chilli for less heat. 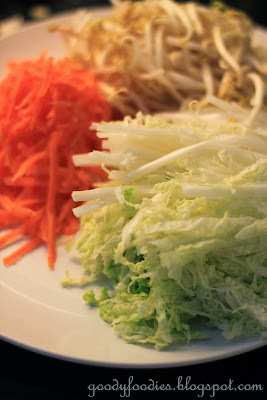 We love the beautiful, attractive colours of this salad and it certainly is refreshing to eat. 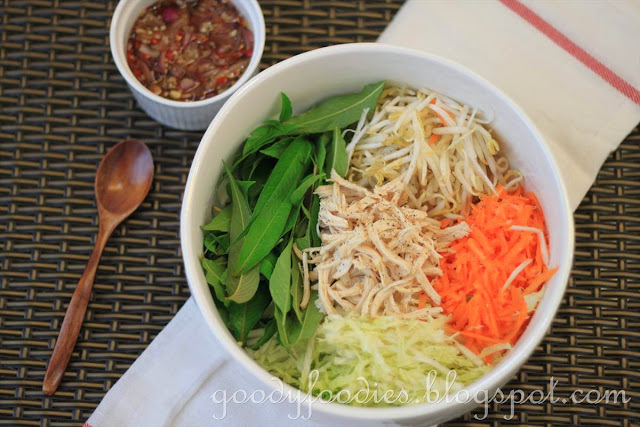 Would work well as a side dish or even as a main dish for lunch. 1. Preheat the oven to 220°C (roast mode). 2. Season the chicken with salt and pepper. In a frying pan, heat oil over medium high heat. Once pan is hot, place chicken in the pan and sear for 2 minutes on one side, then flip over and sear for another minute. 3. Remove from pan and place chicken on a baking tray. Cook in preheated oven for 12-15 minutes, or until cooked through. To test if the chicken is cooked, pierce in the thickest part and the juices should run clear. Allow to rest for 10 minutes. 4. Once rested, shred the chicken into thin strips using your hands and set aside. 5. 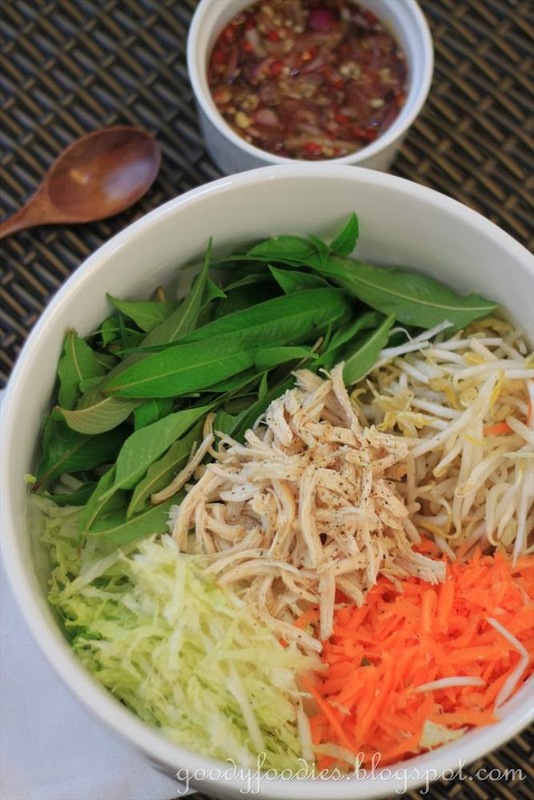 To make the dressing, combine all ingredients in a small bowl. 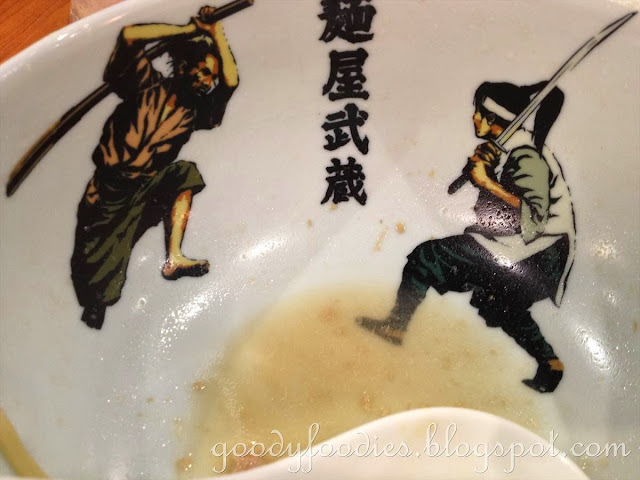 Stir until sugar is dissolved. 6. To assemble the salad, arrange beansprouts, carrots, Chinese cabbage and herbs in a large salad bowl. 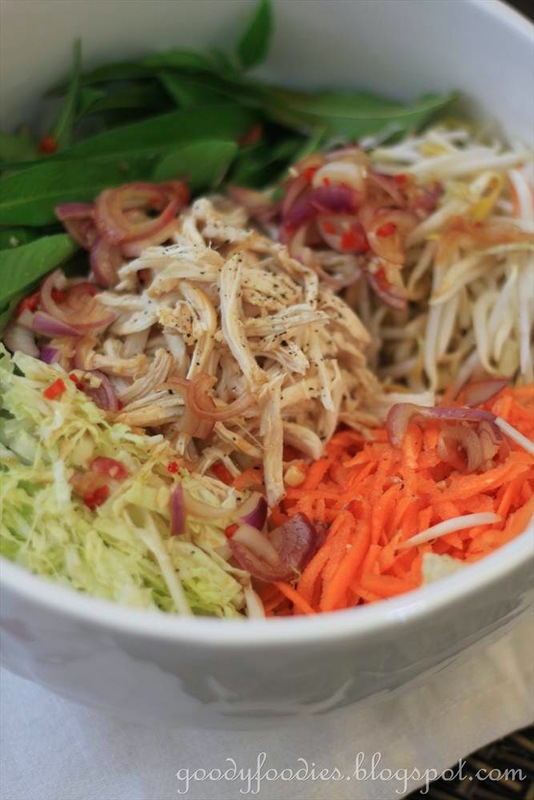 Place the shredded chicken in the centre, then pour over dressing and toss. Dear readers and friends, a very Merry Christmas to you all. Wishing you a wonderful celebration with your loved ones at home. 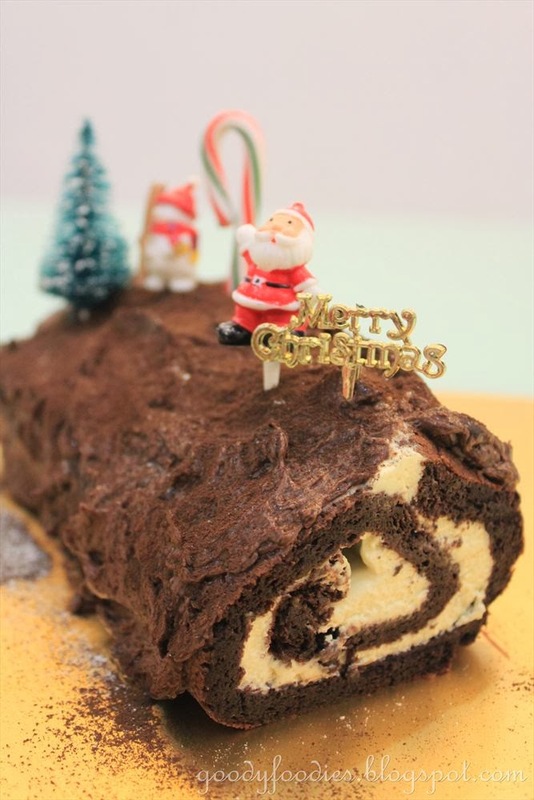 A yule log or Bûche de Noël is a cake traditionally served during Christmas time. 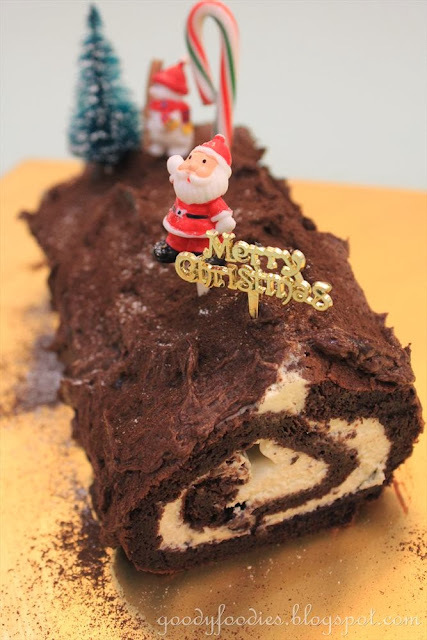 Last year, The Unc was home with us for Christmas and we decided that we should attempt making a chocolate yule log for Christmas Day. It turned out easier than expected, all we had to do was bake a cake in a Swiss roll tin, then fill it with melted chocolate and whipped cream, then roll it up to resemble a Swiss roll . 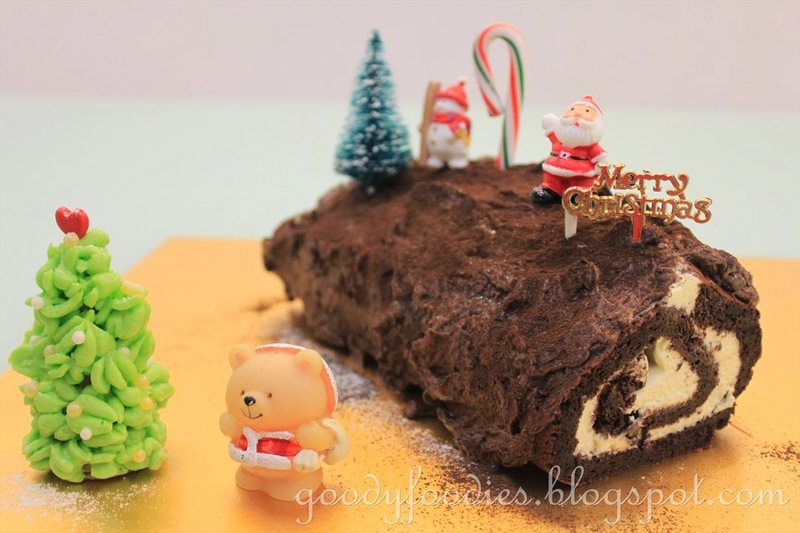 Do not worry if it cracks a little when you roll it, as you will be covering the imperfections with more chocolate frosting. Get out your festive decorations - we topped our yule log with a snowman, candy cane, Christmas tree and Santa Claus, and not forgetting, a dusting of snow powder for a white Christmas. 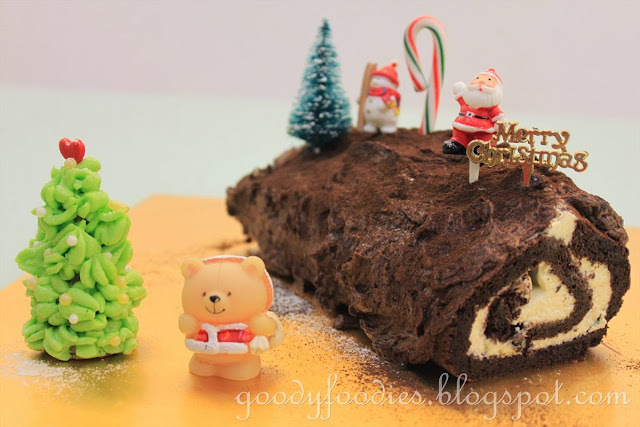 The yule log definitely added a festive air to our celebrations at home. 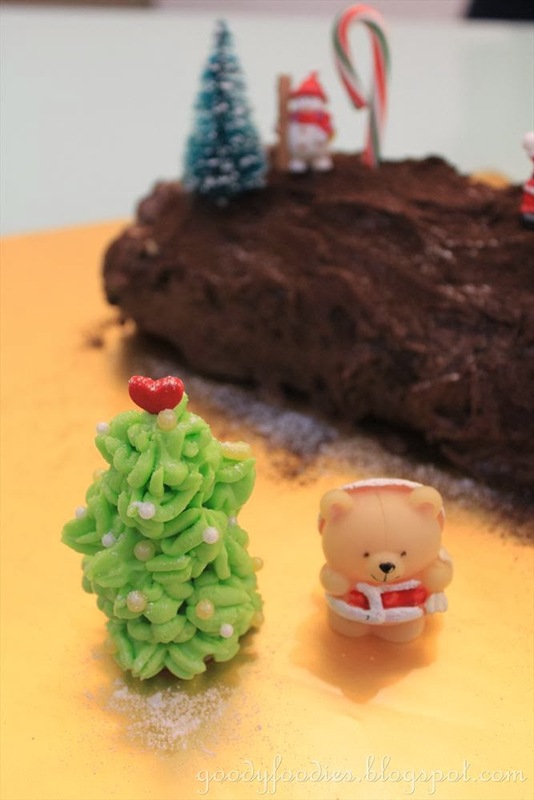 Last year, many of my blogger friends also made Christmas trees using mini ice cream cones and green frosting. This mini Christmas tree was decorated with some edible balls (for baubles) and topped with a red heart. The kids thought it was really cute! Recipe adapted from James Martin "The Collection"
1. Preheat oven to 350°F/180°C. Lightly grease a 12 x 8 inch (30 x 20 cm) Swiss roll pan with sunflower oil and line with parchment paper. 2. Put the chocolate into a small heatproof bowl over a pan of hot water (the bowl must not touch the water) and heat gently, stirring occasionally, to melt. Let cool. 3. 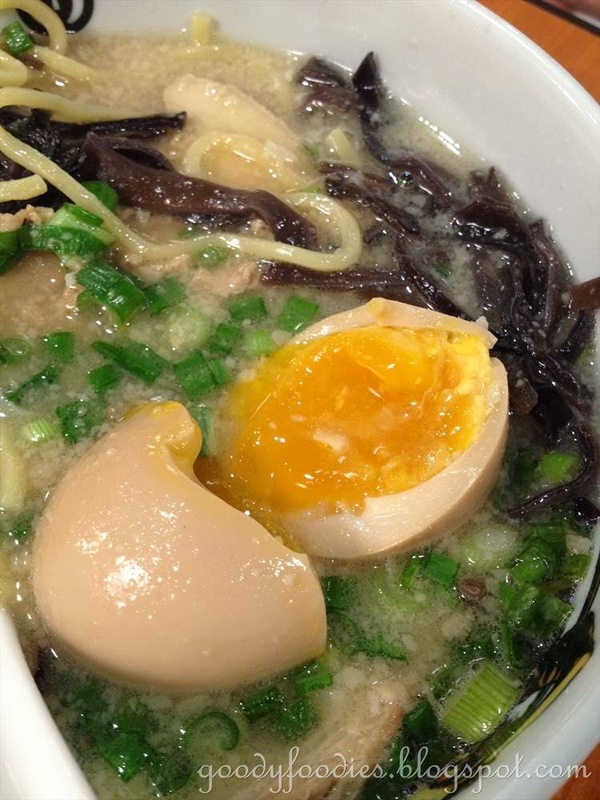 Whisk the egg yolks and sugar together in a large bowl until light and creamy. Place the bowl over a pan of hot water, add the cooled chocolate and stir to blend evenly. 4. In a separate bowl, whisk the egg whites until stiff but not dry. Carefully fold into the chocolate mixture. Turn the mixture into the prepared tin, tilting it so that everything spreads evenly into the corners. Bake for 20 minutes, or until firm to the touch. 5. Remove from the oven. Place a dry tea-towel on the cake, and on top of this layer another tea-towel that has been soaked in cold water and well wrung out. 6. For the filling, melt the chocolate as above, then allow it time to cool. 7. 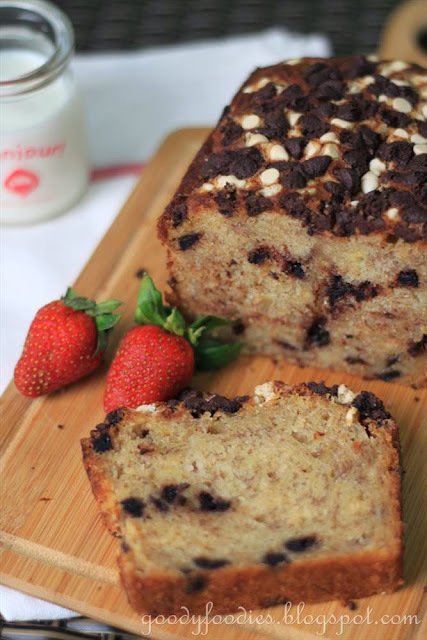 Remove the tea-towels and turn the sponge out on to a piece of baking parchment. Peel the lining paper off the cake. 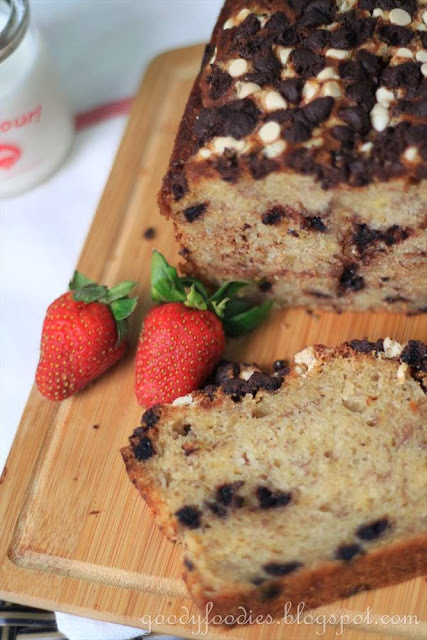 Spread the melted chocolate over the cake, then spread the whipped cream on top. 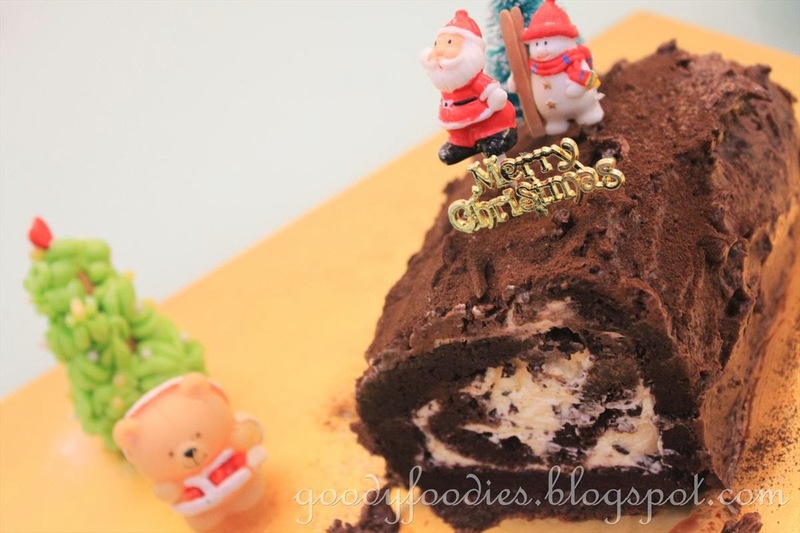 Roll up the cake from the long edge, using the paper to help lift and roll. 8. For the coating, melt the chocolate as above. Allow it to cool and add the cream. The mixture should turn smooth and glossy. Spread roughly over the Swiss roll, then dust with cocoa powder and snow powder (or icing sugar) for snow and decorate with Christmas figurines. 1. Beat cream cheese in a mixer until very smooth, about 2 minutes, then add the sugar and beat for another minute. Add food coloring until blended. 2. Fill into a disposable piping bag with a star tip. Place cone on cake tray with end facing upwards. Pipe frosting all over tree. Decorate with edible balls (as baubles) and place a heart on top of the tree. 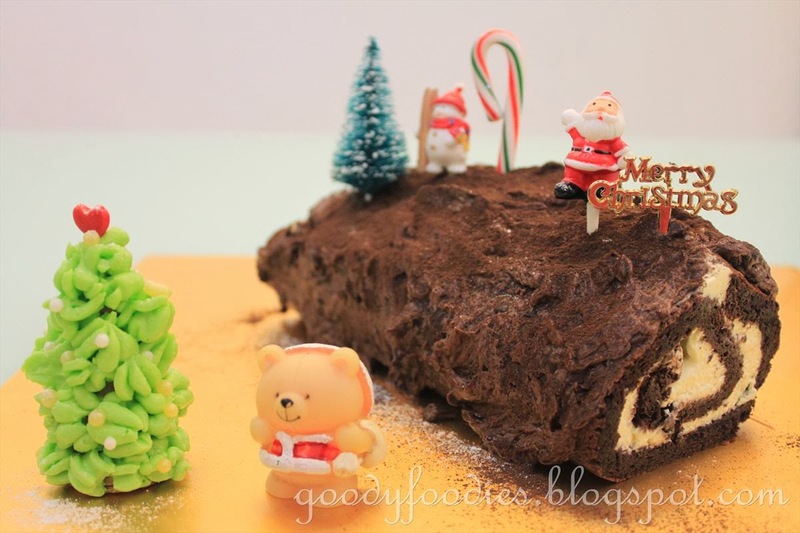 I am submitting this to Bake-Along #56 : Theme - Christmas Log hosted by Lena, Joyce and Zoe. *This recipe was featured on Asian Food Channel's FB page on 26 December 2013.